Associate Professor Alex Lobos is one of the recipients of this year's Eisenhart Award for Outstanding Teaching. Alex Lobos said he always felt a “calling” to be an educator. Lobos, a recipient of this year’s Eisenhart Award for Outstanding Teaching for his work in CIAS, said receiving an award celebrating teaching excellence at RIT “provides tremendous validation and gives reason to do what I do”—especially when he learned his nomination came from his students. He’s also proud that student projects from his courses have received awards at more than 15 national and international design competitions in recent years. He moved to the United States in 2002 and since then has focused on sustainability, emotional attachment and user-centered design as means to elevating quality of life. He has taught and lectured throughout Europe, Asia and North and Latin America. Since arriving at RIT eight years ago from General Electric, his research and academic work have been sponsored by leading companies such as Autodesk, General Electric, Makerbot, Staples, Unilever and Wegmans Food Markets Inc. He is also member of Autodesk University’s advisory council and Material Design Journal’s editorial board. After Lobos spearheaded RIT’s relationship with Autodesk in 2011, the research and design collaboration has flourished. He has attended joint conference presentations with company executives as part of Autodesk University, and the company has sponsored several multidisciplinary research projects involving sustainability, accessibility and additive manufacturing. RIT is one of only four universities Autodesk has signed a memorandum of understanding agreement to work together even more. Like design, education has been a strong focus for Lobos throughout his life. He is a Fulbright Scholar and holds an MFA degree from the University of Notre Dame and a Bachelor of Industrial Design from Universidad Rafael Landivar. 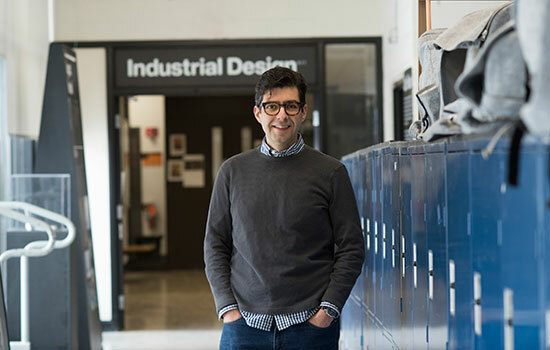 As an extended faculty member of the Golisano Institute for Sustainability, Lobos said teaching at RIT has enabled him to combine his affections for design and the environment. Outside of the classroom, Lobos is an avid marathon runner and professional drummer. Upon learning of his former professor’s drumming performances in North and Latin America, Lin went to see one of his concerts at Lovin’ Cup near the RIT campus earlier this year.